Interested in the written arts? 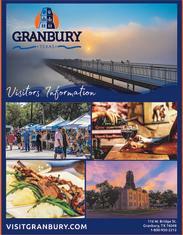 Plan your Granbury Getaway this September! The Langdon Review of the Arts in Texas is an annual publication of Tarleton State University providing an overview of the year’s most exciting cultural accomplishments in Texas. The Langdon Review Weekend is an annual literary and arts festival that takes place just after Labor Day, and also where the new publication is unveiled. At the review, attendees can enjoy poems and readings, picnics and live musical performances. The event is held at the Dora Lee Langdon Cultural and Education Center in Granbury, Texas, where most of the presentations and activities also take place. In 2018 the Literary Review Weekend is September 5th - September 8th. For a complete schedule visit the Langdon Literary Review Weekend website.